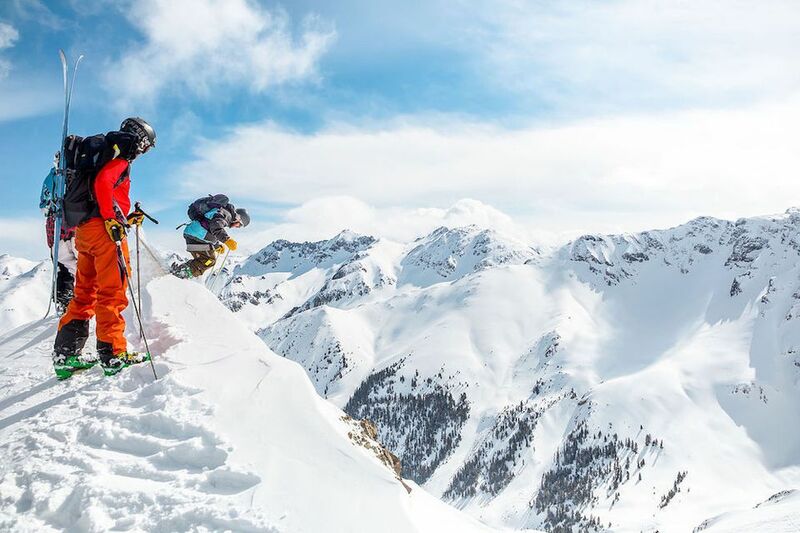 If you're looking for some serious altitude for your next ski outing, look no further than Silverton Mountain in Colorado. With an altitude of 13,487 feet, it is the highest ski peak in the U.S. and boasts more than 400 inches of snow each year. While there aren't a lot of frills to be found on Silverton, it does offer plenty of great powder and a backcountry-feel that is accessible by a single chairlift. Not for the faint of heart or inexperienced, this is a destination that will nevertheless leave you breathless as much for the fast runs and intense vertical, as the thin air. Pro Tip: Bring avalanche safety gear. It is required at all times on Silverton. Located in the heart of the San Juan Mountains, which are a sub-range of the Rockies, Teluride is nestled amongst the highest concentration of 13,000 and 14,000-foot peaks in all of North America. The resort boasts nearly 150 runs spread out across 2000 acres and receives more than 300 inches of snowfall on average each year. And if the resort's 13,150 feet of elevation wasn't already impressive enough, it also boasts one of the longest vertical drops in the U.S. as well. Skiers plummet more than 4425 feet on a single run from the summit to the resort below. Arapahoe Basin – or A-Basin as it is known in ski circles – isn't especially large (just 960 skiable acres), but it does feature 100+ runs, plenty of snow (350 inches per year), and a season that often stretches from October to June. That makes it popular amongst skiers and snowboarders who want to hit the slopes early and hang on well into the spring to get those last few turns of the year. Its 13,000+ foot elevation helps to make that extended season possible, keeping the snow around a lot longer than most other resorts found at lower altitudes. Located near Georgetown, Colorado; Loveland Ski Area is easily accessible thanks to the fact that is is just 53 miles from the city of Denver. The resort offers free snowcat skiing along the Continental Divide and features more than 1800 inbounds skiable acres with 94 trails and 8 lifts to keep the traffic flowing. And with an average of 422 inches of snow each and every year, there is always plenty of fresh powder to be had too. Just be sure to take it easy when you first arrive, it can take a few days to acclimate to the thinner air. Another legendary ski destination, Breckenridge is home to the highest quad chair ski lift in the entire world. It also boasts nearly 3000 skiable acres and an impressive vertical drop of 3398 feet. While the resort is one of the most visited in North America, its 32 total lifts – including 1 gondola – helps to keep the traffic flowing along at a brisk pace. Breckenridge is home to 155 total runs, with its longest – dubbed "Four O'Clock" – stretching for more than 3.5 miles from top to bottom. Contrary to popular belief, Colorado isn't the only state to be home to excellent high altitude ski options. New Mexico has its own great ski destination in the form of Taos Ski Valley as well, luring some of the top free skiers in the world on a yearly basis. With its 110 trails, 15 lifts, and 1200+ skiable acres, the resort has plenty to offer skiers and snowboarders of all levels of experience. It also receives over 300 inches of snow on an annual basis, giving it some of the best powder in the country. If you're looking for a high-altitude alternative to the classic Colorado ski designations, Taos is your best option. Colorado's Keystone Resort may not get as much snow as some of the other mountains on this list ("just" 235 inches/year), but it makes up for it by giving visitors plenty of room to play. The ski area stretches out across 3148 acres and offers 130+ individual runs to explore. It also has a world-class terrain park and offers visitors opportunities for night skiing and guided backcountry cat skiing as well. Another big Colorado mountain with plenty of trails (146), lifts (22) and skiable acres (2450), Copper Mountain is located just 70 miles from Denver and sits on land that is leased from the U.S. Forest Service. The terrain is well suited for skiers and snowboarders of all experience levels, with the option to go tubing when you're ready for an entirely different kind of thrill. Speaking of thrills, Copper is also home to a 22-foot superpipe for those who love the acrobatic side of snowboarding and skiing. Crested Butte Mountain Resort is another fantastic destination for skiers and snowboarders of all experience levels. Its more than 120 trails are geared more towards the intermediate skier, but there is plenty for beginners and experts to do too. The resort offers 1500+ skiable acres, 16 lifts, 2 terrain parks, and receives more than 300 inches of snowfall per year. In the summer, it also becomes a top-notch mountain biking destination, attracting riders from all over the world.